Growing up in the beautiful mountains of Berchtesgaden -- just steps from Adolf Hitler's alpine retreat -- Irmgard Hunt had a seemingly happy, simple childhood. In her powerful, illuminating, and sometimes frightening memoir, Hunt recounts a youth lived under an evil but persuasive leader. As she grew older, the harsh reality of war -- and a few brave adults who opposed the Nazi regime -- aroused in her skepticism of National Socialist ideology and the Nazi propaganda she was taught to believe in. In May 1945, an eleven-year-old Hunt watched American troops occupy Hitler's mountain retreat, signaling the end of the Nazi dictatorship and World War II. As the Nazi crimes began to be accounted for, many Germans tried to deny the truth of what had occurred; Hunt, in contrast, was determined to know and face the facts of her country's criminal past. 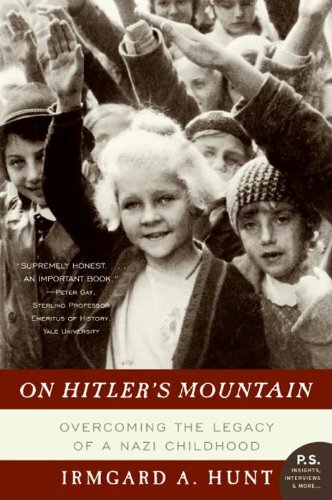 On Hitler's Mountain is more than a memoir -- it is a portrait of a nation that lost its moral compass. It is a provocative story of a family and a community in a period and location in history that, though it is fast becoming remote to us, has important resonance for our own time.